Why choose a medical illustrator? Medical illustrators are professional artists with extensive training in medicine, science, communication and media technology and hold advanced degrees from universities affiliated with medical schools. As visualization specialists, they create imagery that advances medical science knowledge and empowers health literacy for patients and the public. They have the medical and scientific knowledge to grasp complex information, distill it down and communicate the story in a clear visual narrative that is accurate, educational and engaging. Mary Quinn Cooper, Practitioner’s Guide: The Use of Demonstrative Exhibits at Trial, 34 Tulsa L.J. 567, 568 (Spring 1999). What can a medical illustrator do for my case? A medical illustrator is able to review depositions, medical records, and medical imaging and translate that information into images that are easily understood by a layperson. A high quality, medical illustration or timeline is an investment in your case. 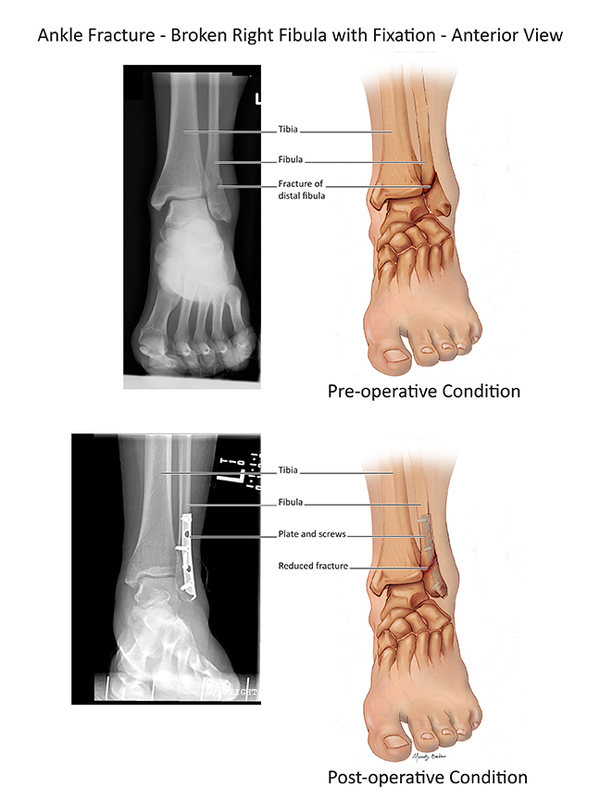 Customized drawings that help a lay person understand what is happening in an x-ray, CT scan, or MRI, and clarify the mechanism of injury, can result in positive outcomes for your clients. Medical illustrations are cost-effective and may be the best investment you make in your case. 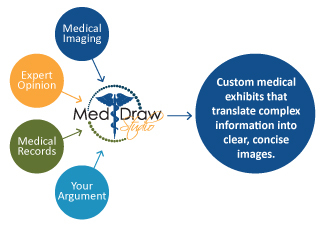 An accurate medical illustration, created in cooperation with your physician or expert witness, is more than just a textbook illustration, it becomes a demonstrative used to maximize the value of the case, enhance settlement negotiations, and increase the effectiveness of medical expert testimony. While anatomical images from text books are great for educating anatomy students, in addition to being copyrighted, they are not always the best way to educate a lay person who will most likely have a much more limited knowledge of anatomy. A custom medical illustration designed specifically for your case highlights exactly the information that you and your physician want to communicate while eliminating excess labels and non-relevant organs. X-rays, CT Scans and MRIs are great for physicians and their support teams who know what they are looking at, but to the untrained eye they can be confusing. A medical illustrator provides medical film interpretation (Figure 1) to make these images understandable to a lay audience. The best illustrations for your case will be created by a team consisting of the attorney, the physician, and the medical illustrator. The illustrator needs to know your plan for the case and needs information about the case to be able to understand the injury, the sequence of medical treatment, and the final results. This is usually done by an initial consultation with the attorney and then a review of the medical records, depositions, and any medical imaging that is available. From this, the illustrator determines how best to show the injury to the jury and writes up a proposed list of exhibits which you can discuss with your expert. John G. Kelly Partner: Kelly & Ignoffo Law Group. Once approved, the illustrator will prepare preliminary pencil sketches for you and your experts to review and sign off on the medical accuracy. A good medical illustration is often a bit of a back and forth process between the attorney, the physician, and the illustrator. Once the physician and the attorney sign off on the sketches, final exhibits will be prepared and delivered in the format you request including exhibit boards and projection files.